Not long ago I wrote to you about The 3 Most Important Roles for Your Women’s Retreat. 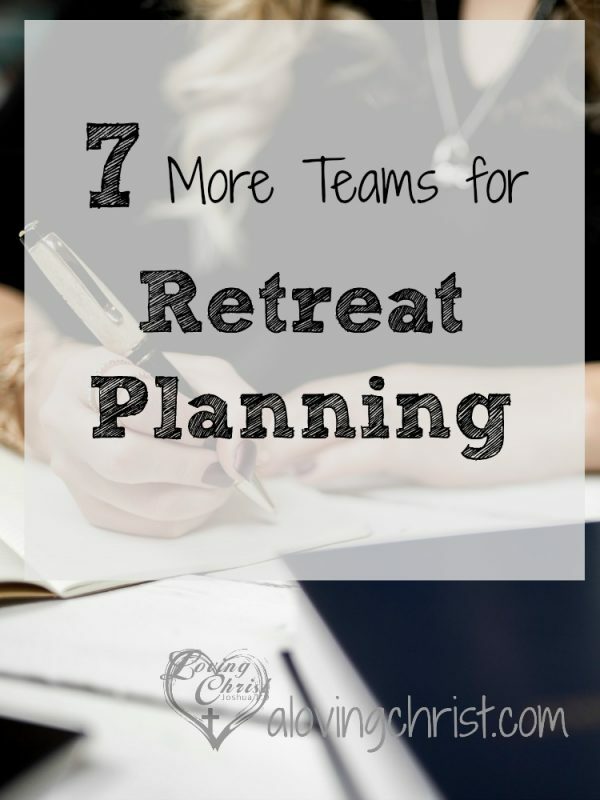 These roles touched on the retreat planning team you need from the start. However, preparing for a retreat consists of many more duties and without enough help it can get overwhelming. That’s why I wanted to give you a few more ideas for teams that can help you get things done and allow more women to step in and help by using their own gifts and strengths. Many women like ‘buy in’ and when they are a part of the planning and implementing, they’ll be even more invested in participating in the retreat. Decorating team – This team is responsible for planning decorations, putting them up, and removing them at the end of the retreat. This includes table displays and any other fun or needed decorations. Many ladies love cute decorations and will feel even more welcome than if you have none. Good decorations show you took the time to make everything extra nice for them. Prayer team – This team will not only pray for all aspects of the retreat but could also contact others who might be willing to pray as well. We always walk through the facility and pray so this could be something this team takes on. Other things to pray for would be speakers, weather, attendees, and anyone or anything else related to the retreat. Food team – This team can help plan meals, take and make orders if ordering from a restaurant, cook, clean up. Depending on the length of your retreat, you might want more than one food team. This way each team might only be responsible for 1 or 2 meals rather than many. Publicity team – This team is responsible for publicity. We’ve usually submitted press releases to our local newspaper and Christian radio station. Other options include your state-wide denominational newsletter, television, and flyers at local Christian stores. Audiovisual team – This team helps put together presentations and run the computer and projector at the event. Greeter team – This team can greet people as they come in, help them sign in, distribute packets and/or goody bags, and help the ladies find a place to sit. Follow-up team – This team helps follow up with thank you calls and thank you notes to all of those involved in the event. We send thank you cards to anyone who helped us set up the facility, set up sound equipment, donated money or items, etc. I’d rather send too many thank yous than not enough! Often, there aren’t enough ladies to form all of these teams, but if you can get enough to volunteer, your job will be so much easier! What other teams have you used before? Comment below and let us know.